William Paul Schneider was born on April 9, 1918, in New York City, New York; he was the son of William Schneider and Anna (Cirofici) Schneider. William married Lina Louise Jenkins on June 30, 1945, in New York City, New York. William passed away on October 7, 2015, in Charlottesville, Virginia, and is buried at Scottsville Cemetery, Scottsville, Virginia. William Paul Schneider, 97, passed away on Wednesday, October 7, 2015, at his residence at Our Lady of Peace in Charlottesville, Virginia. Bill was born in 1918, in the Bronx, New York, the only child of the late William Schneider and Anna Cirofici Schneider. 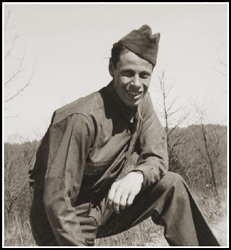 Following the war, Bill found employment at The Woodlawn Cemetery as an auto mechanic, and spent the next 37 years there in several capacities, ultimately rising to the position of cemetery General Manager. He served for a number of years as the president of the New York Metropolitan Cemetery Association. He and Bobbie made their first home together in Woodlawn, where sons, Fred and Jim were born. When the family moved to nearby Yonkers, New York, Bill served as Cubmaster in the local Cub Scouts troop and continued to be active at St. Luke's. 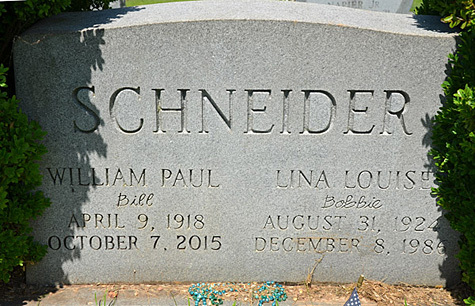 Bill was preceded in death by his wife of 41 years, Lina Louise Schneider. He is survived by his two sons, Frederick W. Schneider and his wife, Irene Dorrier, of Charlottesville, and James R. Schneider and his partner, Edward Strickler, of Scottsville; his granddaughter, Lina B. Schneider, of State College, Pennsylvania; and many other relatives and friends. Funeral services will be held at Scottsville United Methodist Church on Sunday, October 11, 2015, at 3 p.m. with the Rev. Bruce Lugn officiating. Burial will follow at the Scottsville Cemetery. The family will receive friends at Thacker Brothers Scottsville Funeral Home on Saturday evening, October 10, 2015, from 6:30 until 8 p.m. The family request that in lieu of flowers, consideration be made of a contribution to The Scottsville Rescue Squad or The Scottsville United Methodist Church. Family and friends may share memories and photos at www.thackerbrothers.com.